Last year our Labour Government was responsible for the passing of the Electoral Finance Act, a new set of laws regulating political advertising. The act has always been a bone of contention since its introduction, and it has been recently slammed by an Auckland law professor as an attack on freedom of speech. Professor Bill Hodge says that Michael Cullen, Deputy Prime Minister has failed to protect our right to free expression. So what’s wrong with this law? A few things, actually. Here’s a simple list of regulations that the law involves. If you want people to Adopt a set of beliefs, you can promote them, right? Sure, you can put up posters, pay for billboards, buy advertising on TV and radio, and so on. How much can you spend? As much as you like! It’s your money, and you’re using to do no more than express yourself and promote your beliefs (or sports club. or whatever, you get the idea). The Electoral Finance Act changes all that. As a citizen you can’t do that when it comes to trying to influence the opinions of potential voters. You’re not allowed to use your own resources at your own discretion to try to encourage people to vote (or not vote) a particular way. If you happen to be a millionaire businessman who’s sick and tired of the interventionist approach of Labour, not sure which party you want to support, not a member of any party, you are forbidden by law from spending, say, $200,000 on a campaign to encourage people not to vote for them. You may not do that, never mind the fact that it’s your money. The “regulated period” for the Electoral Finance Act 2007 (Act) began on 1 January of this year and will end with the close of polling day. During this period, the provisions of the Act regulate a variety of activities the costs of which may be deemed under the Act to be “election expenses”. This is the cause of some anxiety amongst clients who, by reason of their financial support for political parties or their engagement in questions of public policy, fear they may be required to comply with the complex provisions of the Act. Advising such clients is not easy given the vague wording in some key provisions, and the interrelationship between provisions scattered throughout the Act. Moreover, penalties of imprisonment for up to two years and/or fines of up to $40,000 for wilful breaches (“corrupt practices”) or up to $10,000 for any other breaches (“illegal practices”) are likely to have a chilling effect for clients with a low appetite for risk and no wish to become a test case. For laws with such stiff penalties, it’s particularly troubling that the law community is complaining about how difficult to interpret the law actually is. … or for a type of party or for one or more candidates or for a type of candidate that is described or indicated by reference to views, positions, or policies that are or are not held, taken or pursued, whether or not the name of the party or the candidate is stated. Let that sink in. If you try to encourage people to vote or not for a general type of party or candidate, even if you offer no indication of which party or candidate would be the best, you can’t spend as much money as you like, and you have to tell everyone where you live. 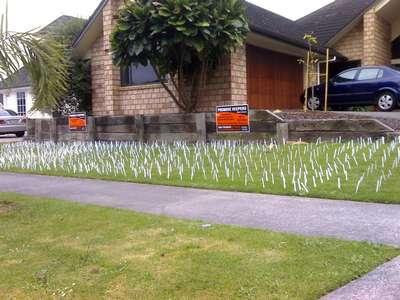 Decorated by strangers int he night with – get this – 1,000 (plastic) knives, with a threatening note taped to his front door – just in case there was doubt about why the knives had been put there. It’s a rather convenient way to find out where your political opponents live. Just require them by law to tell you!